Would it surprise you to discover that China is planning to add 800 miles to its subway system over the next two years? That's the distance equivalent to building a network from Dallas to Chicago in less time than the U.S. Congress can resolve a budget! In 2015, when the infrastructure build-out is complete, China's subway track alone will be a mind-boggling 1,900 miles, according to JP Morgan. The Asian giant has been in the midst of constructing the world's largest transportation system, laying mile after mile of high-speed rail and subway track. According to the World Metro Database, Beijing and Shanghai currently have the longest metro and subway systems, with about 275 miles each. The city of Guangzhou in China also falls in the top 10, with 144 miles of rail, beating Paris' network length of 135 miles. This ambitious program is part of the pragmatic solution to help 1.3 billion residents move around the country efficiently and reduce the increasing problem of air pollution due to car emissions in big cities including Beijing. The circulating reports and photos of Beijing's smog have recently become a dark cloud hanging over the country's remarkable achievements, but it's not a new issue. In the winter, smog conditions can seem much worse. Pollutants tend to linger when the air is heavier and colder compared to lighter, warmer air during the summer. In addition, the city is located near the Gobi Desert and has always been subject to sand and dirt storms, even back in the days when it was called Peking. The U.S. experienced similar sand storms during the Dust Bowl in the 1930s, which caused catastrophic ecological and agricultural damage to the American prairies and made the economic impact of the Great Depression much worse. Sixty-five percent of the topsoil was blown away and millions of people were left homeless. 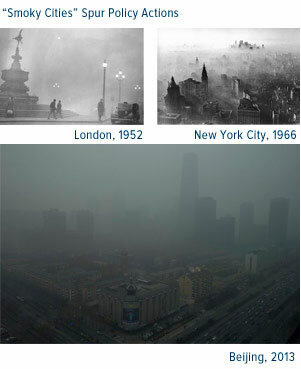 Industrialization in Beijing has certainly aggravated the matter, but Beijing is not the first city suffering from its horrible haze. The London smog of 1952 caused 12,000 total deaths, resulting in the Clean Air Act of 1956, and according to the U.S. Environmental Protection Agency, Manhattan suffered particularly poor air quality in the 1960s, affecting the eastern edge of the U.S.
Because of the government's concerted effort to encourage consumption and help its residents achieve a higher standard of living in previous five-year plans, new cars congested the roads as fast as they were paved. Over the past decade, sales accelerated from less than 5 million vehicles in 2002 to nearly 20 million in 2012. About 114 million automobiles are now registered to Chinese residents, with ownership exceeding 1 million across 17 Chinese cities. As we've discussed many times, the country is also the world's largest energy consumer, with a huge dependence on fossil fuels, especially coal. You may think that the country's use of coal would be the single largest factor driving air pollution, but, in Beijing, emissions from vehicles make up a bigger percentage. One-fifth of the fine particulate matter, which is made up of nitrates and sulfates, organic chemicals, metals and dust particles, comes from automobile and truck emissions in the city, according to JP Morgan. Across the entire country, automobiles cough out 27 percent of total nitrogen oxide emissions. With residents dealing with increasing cancer-causing pollutants and vehicle congestion on roads, public discontent is rising, "adding particular urgency to causes such as environmental protection and public sector reform," says JP Morgan. China's government policies were already addressing air pollution by "requiring thermal power plants to install desulphurization systems and progressively increasing vehicle-emission standards," according to the research firm. As one recent example, last May, I discussed Beijing's additional subsidies devoted to energy-efficient products, including fuel efficient cars, LED lighting, and high-efficiency motors. This year, leaders appear ready to continue these environmental priorities. In comparison to last year's budget, a larger portion of government spending will go toward environmental programs. While other areas will see a decrease in spending compared with last year, spending on environmental protection is projected to grow nearly 19 percent, says JP Morgan. With a concrete plan and a budget in place, it all boils down to execution and enforcement. And in March, the once-in-a-decade transfer of power became official, as the National People's Congress in China elected Li Keqiang as premier and Xi Jinping as president. Xi now holds the three most powerful titles in elite Chinese politics: the Secretary General of the Party, the Chairman of Military Commission and President of the Nation. This "triple-power strength" positions him as an ideal reformer for China. He may likely have little interference from former leaders, giving him a freer hand to tackle some of the growth challenges in China today, including reforms to improve environmental protection. We look forward to watching these leaders in action.